bread vada recipe with step by step photos - simple yet tasty recipe of vadas made with bread, spices and herbs. take 5 slices of bread and break them. add in a grinder jar. pulse or grind to get a texture like bread crumbs. take the bread crumbs in a mixing bowl. add ⅓ cup chopped onions, 1 teaspoon finely chopped ginger, 1 or 2 green chilies (chopped), ¼ cup chopped coriander leaves, 8 to 10 curry leaves (chopped). also add ⅛ teaspoon black pepper (crushed), ¼ teaspoon cumin seeds and a pinch of asafoetida. now add 3 tablespoons rice flour, 2 tablespoons fine sooji (rava or cream of wheat), ¼ cup fresh curd and salt as per taste. keep a check on salt as bread already has salt in it. then begin to knead to a smooth dough. you may not need to add water as the curd and the moisture from the onions helps in binding the dough. if you are not able to bind to a dough, then sprinkle some water and knead to form a smooth dough. divide the dough in to small or medium sized balls and then flatten them. keep aside. heat oil for deep frying in a kadai. check the oil temperature by dropping a small portion of the batter in the oil. if the small vada comes up steadily and quickly, the oil is hot enough for frying. now carefully slid the prepared vadas in the hot oil. fry the bread vadas till crisp and golden. when the onions on the crust of the vada, look golden, this means the vada is done. once nicely crisp and golden, then remove the bread vadas with a slotted spoon. place them on kitchen paper towels to get rid of extra oil. fry the remaining bread vadas this way in batches. 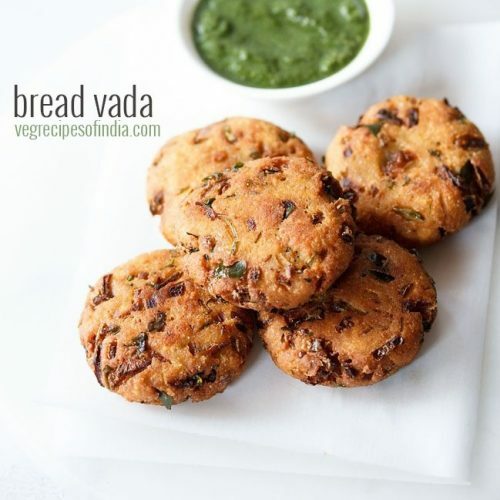 serve bread vadas hot with tomato ketchup or mint chutney or coriander chutney or with coconut chutney.